For a brief period following the Civil War, there was an effort to educate former slaves and their children. For a brief period, there was an effort to offer some level of reparations via land and housing. Former slaves were even elected to political office but after nursing its hurt feelings and bruised ego, the South released its wrath against anyone of African descent and enacted laws to take away what little advances had been achieved and Jim Crow became more powerful and widespread than slavery had ever been. Owning slaves had been the luxury of the landowners, the landed gentry. Anyone with white skin could be superior to the new underclass of blacks. 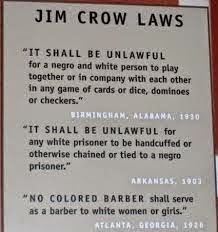 The implementation of Jim Crow is the something rotten in the U.S. It's what no one wants to acknowledge, that racism isn't some remnant left over from slavery; racism was created and nurtured to ensure that black people remained only a step above chattel, no longer bought and sold but still deemed inferior to even the poorest of whites. Jim Crow cast us as the underclass, and denied us all access to "life, liberty, and the pursuit of happiness." 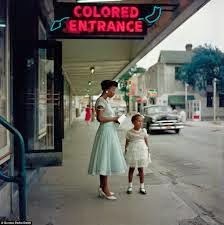 The dialogue that needs to begin is about the post slavery era of Jim Crow. There are still plenty of us around who lived under Jim Crow laws and also plenty of white Americans who benefitted from Jim Crow laws. Invariably when there are discussions about racism in mixed company, someone white will question why we (black people) keep talking about slavery. The commentary goes something like this, "It's long been over and done with and no one is still alive who owned slaves or was a slave." True, and I have no desire to talk about slavery. What I want to talk about is my childhood, my adolescence, my young adulthood and the laws that restricted where I played, went to school, went out to eat, went to the hospital, received medical care, where and how I traveled, where I sat in the movie theater (assuming it admitted me at all) and every other aspect of my life and the lives of all the black people that I knew. It's a lengthy and long overdue conversation and this country still hasn't engaged in it. My early days were spent in a segregated school. My town had a "black section" where "all the negroes lived." 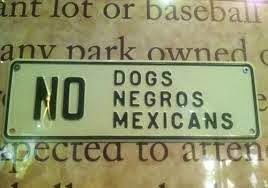 The 1960s brought new civil rights laws putting an end to Jim Crow and all other racially motivated laws but not to all the racially motivated attitudes and behaviors. I agree, we have not had an honest, open discussion about this, ever. The ugly slimy soup of racism has been percolating just under the surface for a long time. Having a black President has certainly caused the pot to boil over and STILL we don't discuss it. The denials of those who continue to perpetuate white superiority and racial intolerance is almost laughable if it wasn't just so disgusting. You raise some puzzling questions about racism. I think it's hard to identify just one origin and there's evidence from other cultures that suggests some of it is rooted in our inherited animal behavior, but certainly to be part of a culture that tolerates and depends on slavery, one has to dehumanize, to invent and stress essential differences and even assign a need to "protect" the enslaved people by enslaving them. There has to be a great fear in places where the slave population or former slave population is large and we see it during reconstruction: the fear of no longer being in control, the fear of vengeance, of tables being turned of God given norms being overturned. I have to notice that the Biblical account of Ham, the supposed ancestor of all dark skinned people got that way in consequence of the shame of having seen his father naked -- a shame that his progeny inherited in Lamarkian fashion. But I digress. Regardless of the origins of racism, the history of it's twisted justifications, the fear a culture has of it's enslaved population obviously plays a part in my opinion. I could suggest that contempt is a band aid one puts on guilt to hide it, but guilt feeds fear and fear feeds racism, I do believe. Thank you for writing about this important topic! 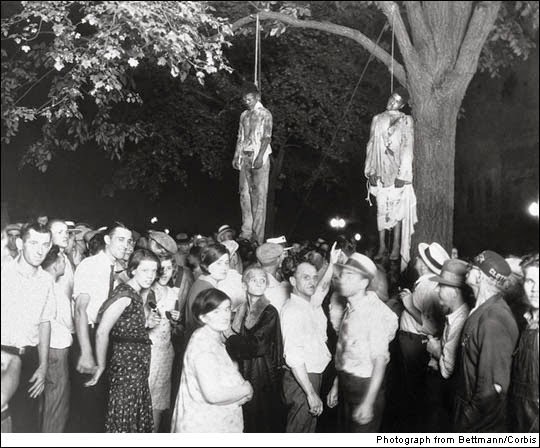 We do need to have a national discussion about this sordid and shameful part of American history, and how the legacy of it continues. Reading The Warmth of Other Suns: The Epic Story of America's Great Migration by Isabel Wilkerson was very educational. Seems to me that we discuss it all the time, but not effectively, tending more to air grievances and denouncements and even self flagellation than to be steadfast. Can we talk about the the things that perpetuate injustice and inequality? Can we remember and act like we're all Americans? Aren't we after all? Isn't it necessary? I listened to Tavis Smiley last night, talking about how his love of the late Dr. King centered around how he remained focused on all aspects of justice for all even after a majority, black and white, had turned against him -- how he saw the Vietnam war and nationalism as part of the mechanism to keep people down, just like racism in general. He never gave in to bitterness and anger. Those photos seem like something from another world, and they are, even if covert racism, unconscious racism, subliminal racism persists in small minds. I remember that world and am amazed even today, at the complacency and acceptance of some people at the time. But I do think that attitudes of all sorts are indeed changing. People are talking to each other, if erratically and unsteadily and emotionally and about the wrong things, the people who insist that we once were and should remain a nation of white protestant males are making a lot of noise, but it's because they're desperate and doomed. Poverty and ignorance and frustration and anger drag all of us down, rich and poor. Modern psychology proves, I think, that the ability to see trends is unreliable and we're encouraged to think things are getting worse without questioning or acknowledging overall statistics. The sparrows and spring Aristotelian thing works both ways. Things are better. I know that Hitler and Lenin and Mao Zedong weakened the argument that since money is power, there is better justice and a better life for the affluent, but still, short of apocalyptic calamity I think the better path is through raising people up rather than riling them up. I'd rather see more black faces at the yacht club and board meetings then shouting in the street. Is there a better future for the kids studying at the library or hanging around the 7/11 at night? Are countries where college is free doing better in terms of equality than we are? Can we talk? Can we make equality happen? Black Power has many meanings. Things that become common tend, I think, to become customary and acceptable in time. My grandchildren don't seem to see anything unusual about black presidents or mayors or doctors or financiers or anything else and it's my hope that with enough of those, justice and equality under the law will follow. Maybe it's sad, maybe I'm wrong, but life is more fair and free for those with power and money. You write: "It's a lengthy and long overdue conversation and this country still hasn't engaged in it." Well said and sadly accurate. Maybe the biggest impediment to such a conversation being undertaken is the fact that most white U.S. Americans (I include myself in that group) are profoundly ignorant about race (and racism) but are just as profoundly convinced they know everything they need to know about the topic. Any of us white citizens who are unfamiliar with the works of Joy DeGruy and Robin DiAngelo (to name two examples) are simply too ignorant to be able to engage in such an exchange with any degree of competence. A young woman who has created a series of video blogs put it wonderfully when she said trying to talk to most white U.S. Americans about race and racism is like trying to explain to a two year old where the moon goes during the daytime. The lack of accurate foundational knowledge and experience with applying that knowledge precludes much of anything resembling a 'conversation'. If we white folks devoted as much energy and effort to acquiring and assimilating accurate factual information as we have to engaging in denial...then...and only then might we be prepared to fruitfully engage in such a conversation.